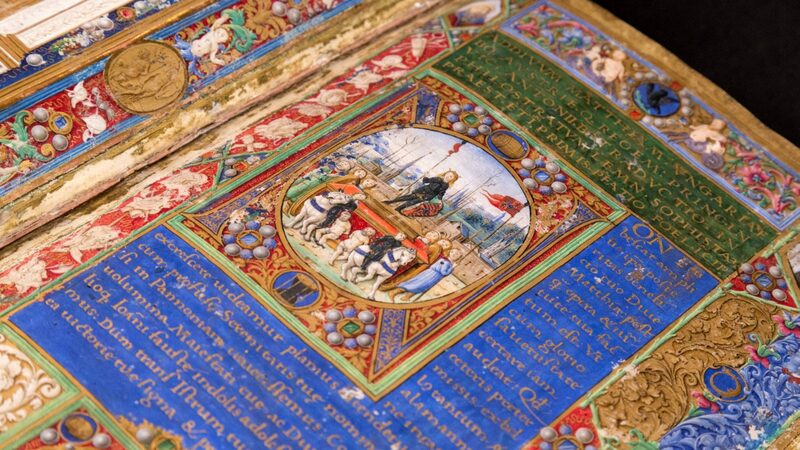 On the pages of the Corvina Library – the collection being an Italian-type Renaissance royal library – basically the Italian miniature art of the middle and the second half of the 15th century is represented in a particularly sophisticated compilation. Even though among the decorations, Central European Gothic elements can undoubtedly be captured as well, the rate of their occurrence is negligible. When ‒ mainly in the late 1480s ‒ not only Italian but also local masters had worked in the workshop of the royal court of Buda, they made great efforts to imitate the Italian style and to copy the Italian codices that had already been there in the library. Although the royal library in Buda was largely made up of codices that had not originally been made for King Matthias, the character of the illuminations was not significantly influenced by this circumstance, since the previous owners, mostly cultivated prelates of the mid-15th century, including Iohannes Vitéz, György Handó, Ianus Pannonius and Péter Garázda, had also compiled their collections from Italian codices, with special regard to codices made in Florence. The Italian – Florentine – characteristic features are evident even in case of stocks/parts of stock that were purchased later, in the second half of the 1480s, especially for the royal library in Buda (see the Sassetti and Tomacelli codices). Consequently, if any alterations can be detected in the illumination of the Italian layer of the Corvina, they might only follow the natural evolution of Italian miniature art. For these reasons, even a sketchy overview should be based on the complexity of genesis. As mentioned above, codices belonging to the prelates of the former generation represent the white vine stem style (bianchi girari), highly popular in Italy in the third quarter of the century. Due to the nature of the relations, the afore-mentioned prelates purchased mainly from Florence-based bookseller Vespasiano da Bisticci, and most of the codices were decorated by contemporary Florentine illuminators. Many items had been made in the workshop of Francesco di Antonio del Chierico, one of the most prominent Florentine masters of the era (for example, Munich, BSB, Cod. Lat. 310; Győr, EKK, Armadio No 1; Modena, BEU, Cod. Lat. 1039), several of them had been made by Chierico himself (Budapest, ELTE EK, Cod. Lat.3., Cod. Lat. 10.; Munich, BSB, Cod. Lat. 69). Furthermore, several illuminations can be attributed to Mariano del Buono as well (for example, Vienna, ÖNB, Cod. 23; New York, Public Library, Spencer Coll. 27). Theophrastos corvina (Budapest, ELTE, EK, Cod. Lat. 1.) may be attributable to the Master of the Trivulziana Pharsalia (alias Maestro di Fiesole, the Fiesole Master). Nevertheless, there are quite a lot of masters in this codex group, who are unidentified or cannot be identified, and who have not been known by their names. Items, purchased in the late 1480s specifically for the royal library from the library belonging to Francesco Sassetti (1421‒1490), head of the Medici banking house, had also been works of contemporary Florentine masters. In addition to the name of Francesco Rosselli (Modena, BEU, Cod. Lat. 472), related names included, among others, Mariano del Buono (Manchester, Chetham’s Library, Cod. No 27 900; Milan, BT, Cod. No 817) and Bartolomeo di Domenico di Guido (Modena, BEU, Cod. Lat. 437, Florence, BML, Plut. 73.4). A special unit within the Corvina Library is formed by the codices of Wenceslaus IV, King of Bohemia (1378‒1419). Two richly decorated volumes had been made in the royal workshops of Prague, and they are representatives of one of the brightest chapters in the history of Bohemian miniature art (Vienna, ÖNB, Cod. 2271; Madrid, BN, Res. 28). A more precise localization of Enyclopaedia Medica, an encyclopedia-like medical book also made in Bohemia at the turn of the 14th and 15th centuries, has not been made. On the frontispiece of the codices, King Matthias’ coat-of-arms had been painted over the coat-of-arms of Wenceslaus (Rome, Biblioteca Casanatense, Cod. Lat. 459 [A.I.20.]). In the corvina stock part, having previous owners, a small number of codices can be found that had been made in the vicinity of Iohannes Vitéz. In Hungary, when he was Bishop of Várad (today’s Oradea) or Archbishop of Esztergom, some of these codices had been decorated by Central European masters in the local Gothic style. One such example is the Victorinus corvina (Budapest, OSZK, Cod. Lat. 370. ), the illumination of which has been referred to the circles of Lehrbüchermeister, operating in Vienna by most recent research. The original layer of the decoration of the Regiomontanus corvina of Budapest (Budapest, OSZK, Cod. Lat. 412., f. 4r) features a similar style. The missal, made in Vienna in 1469 and illustrated by Leherbüchermeister, must have been an occasional episode, and it totally preceded the Italian orientation. According to the dedication, this codex had been meant by Matthias for Franciscan monk Thomas (BAV, Rossiana Cod. Lat. 1164). Italian orders made specifically for the royal library started mushrooming from the middle of the 1480s. At that time, too, Florence-based workshops had been in the foreground. Attavante degli Attavanti was a major partner of the royal court of Buda (for example, Brussels, BR, Ms 9008, BAV, Urb. Lat. 112). At the very end of the decade, a great number of codices were being made for the Hungarian king in Attavante’s workshop but, unfortunately, these codices could not make their way to Hungary because of King Matthias’ death. Later, these books became part of the library of the Medici family. But significant codices were illuminated by Gherardo and Monte di Giovanni as well (Vienna, ÖNB, Cod. 930; New York, PML, 496; Modena, BEU, Cod. Lat. 449; Budapest, OSZK, Cod. Lat. 347.; Prague, Statní Knihovna ‒ Universitní Knihovna, Cod. VIII. H. 73; Florence, BML, Plut. 15.15‒15.17). It is questionable whether the Philostratos corvina (Budapest, OSZK, Cod. Lat. 417.) had been illuminated in Florence or in Buda by Boccardino il Vecchio (in the codex, the work of a minor master operating in Buda can also be detected). A unique group of Italian items decorated specifically for King Matthias is formed by the codices, that had been presented to the king of Hungary as a gift by Italian humanist authors, including the works of the given authors. In this respect, the afore-mentioned Carbo corvina [Budapest, HAS Library and Information Centre, K 397] and the Agathias corvina [Munich, BSB, Cod. Lat. 294], illuminated by Gioacchino de Gigantibus, also belong here; the latter had been ordered for the Hungarian king by Cristoforo Persona, prefect of the Vatican Library. Persona also sent a copy to Queen Beatrix, but this was illuminated by another, so far unidentified master [Budapest, OSZK, Cod. Lat. 413.]. The fair copies were usually decorative codices made in the workshops of outstanding masters. Two of Marsilio Ficino’s surviving gift codices had been decorated by Francesco Rosselli (and/or his apprentices) (Wolfenbüttel, HAB, Cod. Guelf. 73 Aug 2°, Cod. Guelf 12 Aug. 4°); three codices have been connected with Attavante’s workshop by research (Florence, BML, Plut.73.39, Wolfenbüttel, HAB, Cod. Guelf. 2 Aug 4°, Cod. Guelf. 10 Aug 4°, in case of the latter, the name of Littifredi Corbizzi has also come up). Bartolomeo della Fonte had ordered the illumination of his gift codex, compiled from his works and copied with his own hand, also from Attavante, just like Naldo Naldi did in case of his laudatory epic written on the royal library of Buda (Toruń, Biblioteka Kopernika, Cod. Lat. R. 107). Alessandro Cortesi’s manuscript on the laudation of King Matthias was made in Rome, undertaken by Bartolomeo Sanvito, a scribe from Padua; research has identified the illuminator in the person of “Petrus V” (Wolfenbüttel, Cod. Guelf. 85.1.1 Aug. 2°). Battista Mantovano’s Parthenice must have been made at the same time, and maybe also in Rome, in the circles of Sanvito; the illuminator was a renowned Milan-based master Giovan Pietro Birago (Budapest, OSZK. Cod. Lat. 445). The same master illuminated the unfinished pontifical that had been ordered for King Matthias by Bishop of Szerém Iohannes Vitéz, Jr. (Vatican City, BAV, Ottob.Lat. 501). Antonio Bonfini’s Symposion can also be regarded as a gift codex (Budapest, OSZK, Cod. Lat. 421). It cannot be identified whose work was the modest decoration of the decorative copy, not suggesting a professional illuminator; the possibility of Bonfini’s involvement has also been discussed by research. The role of Naples in the years of the conscious development of the Corvina Library is perfectly clear, but the city has to be taken into account on the long run. Not so much regular, instead, casual orders had been placed in Naples for the king of Hungary or the royal couple. In addition to the afore-mentioned Augustinus corvina (Budapest, OSZK, Cod. Lat. 121.; the work of Gioacchino de Gigantibus), one such example was the Arrhianus corvina (BAV, Vat. Lat. 5268) kept currently in Vatican City, the illuminator of which was Cristoforo Majoranna, who had worked a lot for the royal court of Naples. Diomedes Carafa had ordered the decorative manuscript of his work entitled De institutione vivendi for both daughters of Ferdinand I of Aragon, for Beatrix and Eleanor. The copy made for Beatrix had been illuminated in Naples by Carlo Rapicano, an illuminator who had also had a significant oeuvre in Naples-based codex production (Parma, BP, G. G.III.170.1654). Epithalamion by Marlianus had been made on the occasion of the engagement of heir to the throne John Corvinus and Bianca Maria Sforza; illumination has been attributed to Ambrogio de Predis of Milan (Volterra, Biblioteca Guarnacci, Cod. Lat. 5518. IV. 49.3.7.). There had been no traces of the decisive steps of unification around 1480. One of the surviving codices had been bound by the same master under the required name “Egidus”, who had frequently worked for Iohannes Vitéz as well. The Regiomontanus corvina of Vienna (ÖNB, Cod.44) – the work of Francesco Rosselli, featuring Queen Beatrix’s coat-of-arms – had probably not even been bound by then; it must have been provided with its velvet corvina binding at the end of the decade, which suggests that the later corvina bookbinder had not yet been present in the royal court in the early 1480s. Even then, however, a rather interesting process could be observed – the same will also be characteristic of the years leading up to 1490 –; illuminators arriving in Buda had started working not only on new copies, but also on the already existing un-illuminated texts left over from the former decades. Research has shown that the source must have been a stock of manuscripts, born some ten years earlier, at the late 1460s, around 1470, in the vicinity of Iohannes Vitéz and Johannes Regiomontanus, the famous astrologist who had been staying in Hungary at that time (for example, Budapest, OSZK, Cod. Lat. 412.; Vienna, ÖNB. Cod. 44). An important item, made in those times, was the Beatrix psalterium (Wolfenbüttel, Cod. Guelf. 39, Aug. 4°), the frontispiece of which had been illuminated by Francesco Rosselli, but the inner initials of which had been painted by a Lombard illuminator. Hand of the same master can be identified in the Gradual of King Matthias as well, consequently, he must have worked on those manuscripts in Buda, most probably around 1480. (If we take into consideration Rosselli’s presence in Buda and the making ready of the copy of the psalterium – Gundisalvus Hispanus’ work can be dated at approximately the same time, the late 1470s, around 1480 –, then the presence of the Northern Italian master in Buda can be supposed at the same time.) However, most parts of the Gradual of King Matthias had been made by a Netherlandish master who had been trained in the environs of Tournai and Lille. Consequently, his presence in the royal court of Buda also has to be taken into account. The afore-mentioned codices can be listed into the same group by their same coats-of-arms as well. Not only had they featured the same coat-of-arms composition, but the same mistake can be detected on them, which happens to be an even stronger group-forming sign. King Matthias’ coat-of-arms would follow the following composition pattern: 1. Hungarian cuts, 2. double cross, 3. Dalmatian panther heads, 4. Bohemian lion. Coloring of the Bohemian lion had been, however, consequently “inverse”: instead of a silver lion on a red background, we can see a red lion against a silver background. On top of that, it is clearly visible in the afore-mentioned codices that originally, there had been a crown on the lion’s head, which was later wiped out. The red lion appeared in the heraldic representation of the Hunyadis. It was John Hunyadi’s coat-of-arms of Life Lieutenant of Beszterce, but there the lion was not double-tailed, and the crown was not on the lion’s head, it was held in its paw. So we have on our hands the contamination of the Bohemian royal coat-of-arms and John Hunyadi’s coat-of-arms. The same “mistake” can also be detected on a representation item, highly significant from the point of view of the Matthias-era royal court: on King Matthias’ throne upholstery. The use of the coat-of-arms is identical in the discussed group of codices and the throne upholstery, so it is conceivable that this common element places the above-mentioned objects in the same group from the aspect of time as well. And this can be dated at around 1480 by the known date of Rosselli’s stay in Buda. The years leading up to 1490 witnessed a conscious, large-scale development of the royal library. Systematic acquisition had been started both in Italy and Buda. From among those involved in the process, we have known the names of Taddeo Ugoleto, royal librarian and educator, as well as Florentine humanists Bartolomeo della Fonte and Naldo Naldi. Naldi had written his laudatory epic on the royal library of Buda (De laudibus Augustae Bibliothecae, Toruń, Biblioteka Kopernika, Cod. Lat. R. 107) at approximately that time. In this period, parallel phenomena had been present in Buda. As if the Philostratos corvina (Budapest, OSZK, Cod. lat. 417.) had stood as an overture at the start of the process, being a highly important item from the point of view of King Matthias’ royal representation. Chief illuminator of the codex was Boccardino il Vecchio of Florence, but the inner, historicizing initials had been made by a minor master, verifiably operating in Buda. In addition, the parchment used must have been local, and the scriptor had also been local, just like the binding. The overall image suggests the possible presence of Boccardino il Vecchio in Buda. The hands of some of the scriptors operating in the royal court of Buda can be identified as well, who had seemingly made efforts to develop a uniform image of writing. Copies made by them include the Philostatos (Budapest, OSZK, Cod. Lat. 417. ), Averulinus (Venice, BNM, Cod. Marc. Lat. VIII. 2=2796) and Beda Venerabilis corvinas (Munich, BSB, Cod. Lat. 175), and the Nagylucse psalterium (Budapest, OSZK, Cod. Lat. 369). Meanwhile, the stock parts having former, previously different owners, had also been unified. Two masters had been working on them, the so-called “first” and “second heraldic master”. Codices had been provided with King Matthias’ coats-of-arms (Hungarian and Bohemian royal coat-of-arms), and the first heraldic painter had painted modest floral ornaments on the frontispiece of the totally un-illuminated items. At the same time, he had painted the inner book starting initials as well. While only coats-of-arms have been known from the “second heraldic master” (sigla M, A on two sides of the coat-of-arms, replacement of silver with white, lion with thin, glazed surface, comprehensive coat-of-arms composition, gold contour), the activities of the “first heraldic painter’ can more easily be outlined. He would not only work on older stock, but also on new copies (Paris, BnF, Latin 1767; Modena, BEU, Cod. Lat. 419 = α O.3.8.). These facts only make the origin of his style more obvious: the illuminator must have arrived in Buda from Florence, from the vicinity of the Attavante workshop. One of the illuminators of the royal copies of the Thuróczy Chronicle must have also been an Italian (Budapest, OSZK, Inc. 1143; Inc. 1143b), most probably a Florentine master; research has known the hand from the early 16th century, from the vicinity of Boccardino il Vecchio. In Buda, he participated in the production of the Vatican missal as well (BAV, Cod. Urb. Lat. 110). In the afore-mentioned copies of the Thuróczy Chronicle, another illuminator of much lower skills than the previous one has also been discovered, who had tried to imitate the style of the first master. It was characteristic of library development and the parallel development of the workshop that local, Central European masters also appeared in Buda. Both in their circles and in case of the minor Italian masters, a characteristic working method emerged: the so-called style imitation. Prestigious items of the library made in Italy or made by Italian masters locally had been regarded as prefiguration. (It is an interesting phenomenon that Francesco Rosselli‘s works continued to be highly popular, as regards imitation.) However, the most significant style that had served as a model for imitation was that of Francesco da Castello, and – if regard him as a separate person – that of Master Cassianus. The time that had been given to King Matthias was not enough for the tendencies starting in the late 1480s to fully unfold. Certain signs indicate that the phenomenon of imitation and the use of already made, prestigious items as a prefiguration would have become more intense, as they had, in fact, become intense to some extent. The radiance of the Renaissance-era library in Buda had an impact on the book art of Central Europe as well.